Tanner, Eugenie and I are thrilled to announce the start of the Gimme Shelter Campaign to help rescue animals. We had already committed 10% of the book’s profits to animal rescue causes when our friend and fellow writer, Dan Cohen, suggested we offer interested organizations discount codes so that their members could save on the book and earn donations for their groups. It took a few weeks to work out the tech kinks but now it’s a reality. By pointing their members and supporters to our online store, www.buygimmeshelter.com, and using the unique codes that we supply, they earn $1.00 for every book sold through their groups. In the coming weeks, we’ll be announcing some of our ‘partners’. Right now, if you know any organizations that could use a helping hand, have them get in touch with us to learn how they can join the Gimme Shelter Campaign. Now that Genesis Awards are behind us, we’d like to thank the Humane Society of the United States (HSUS) for letting us contribute to the cause by offering e-copies of GIMME SHELTER to the celebrity presenters. Hope they enjoy the book as much as we appreciate all the hard work the HSUS does raising awareness of animal issues. For a look at photos of the star-studded gala, check them out on Facebook. Lastly, my sister and mad dog lover Honey pinned me a photo of the most decorated war dog in the history of the United States. Wanna guess the breed? 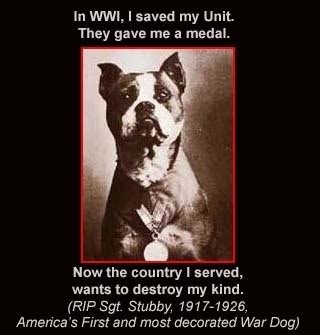 That’s right, a Pit Bull named Stubby.